Update: Anne and her siblings went to another humane society in Martha's Vineyard. We will forward applications to this agency. Anne is one of four puppies who will be available on 3/8/10. She's a lovely pup who loves to play with her siblings as well as follow around the adult dogs and mimic everything they do. They likes toys, balls, and has just discovered bully sticks. She weighs around 23 lbs at 5 months, so might not be too large. She's on Eagle Pack Holistic with supplements. To meet her please fill out an application online and check out our Web site for visiting hours. 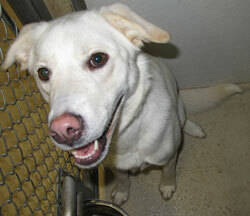 Baby Girl is a one year old Lab who is available on 3/8/10. She has a nice personality and is gorgeous. She will play with other dogs all day and never get tired. She would be great as a second dog or as the only as long as she has opportunities to play. She would love doggy daycare or that sort of setting. She had a family, but was too active (typical Lab), so please be her final home. Please apply online and check our hours to pay her a visit. Beatrice is an little 8 month old Chinese Shar-Pei mix. She's a pretty calm dog, plays well with Lucky. She weighs 27.60 pounds and her DOB is 6/3/09. Beatrice loves people and is very friendly. She enjoys playing and can't get enough of her toys. When she was up in the house at Save A Dog, she went shopping in our retail area....too funny. She is a sweetheart. We took her on a long hike and she loved the sights and sounds of the woods and would check in every so often for some loving! She is good on a leash and good in a car. She is in a foster home, with 2 other dogs and doing great in the house. She is doing great on her housetraining and has not had an accident. She can be met in her foster home once we receive your application! She is a sweetheart of a dog! 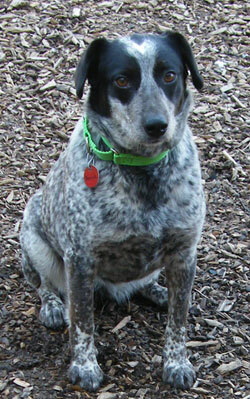 Bonnie is a sweet, submissive 3 year old Australian Cattle Dog who is available. She was given up because her family could no longer afford to keep her. As we're not sure about her background we prefer a quiet adult home for her. She's a quiet dog, seems housetrained, she's very camera-shy so it was hard to get a good picture of her. She doesn't seem like a strong herder, but she has the look and coloring. Please fill out an application if interested and watch for our open hours. It's best to let us know you are coming, in case she goes into a foster home. 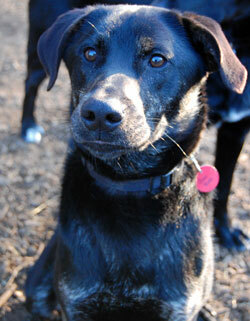 Boo Boo is a 10 month old male neutered black Lab mix who was turned in to a shelter as his owner could not afford him. He is an awesome dog, he's medium, about 45 lbs. and is a nice size for boating or taking for walks. He loves hiking and goes in the woods every day. He loves to chase a ball and will try to pick two tennis balls up at the same time. He likes to play with the other dogs. He's in a foster home and is housebroken and doesn't chew so is safe outside the crate, but he crates well too. He's a generally well-behaved dog, a real dream to add to any household. Please apply online and we can set up a meeting as he is in a foster home! 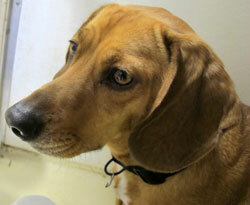 Camden is a 2 year old neutered male Beagle mix. He has Dachshund features but is not short. 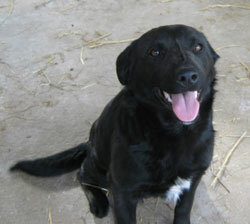 He's a nice dog, gets along with everybody and is very playful and affectionate. He has the most soulful eyes you've ever seen. He's just a really really nice dog with nice calm energy, but likes to play and can be really silly at times. Available 3/8/10. Casey is a 2 year old female Australian Shepherd mix who was turned in with two other dogs after their owner developed allergy problems. She is a nice girl who is already spayed. She is a little dog, Mini Aussie size or the size of a sheltie. She is a happy girl, although her face looks serious here. We found that she avoids the camera at all costs. She needs some work on housetraining, but she crates well, so a structured beginning would be great for her. She is available as of March 22. Please fill out an application on our Web site and we will be in touch. Approximate age: 2 years Approximate weight: 35# Good with large dogs? Yes Good with small dogs? Yes Good with cats? No Good with men? Yes Good with women? Yes Good with children/recommended for a home with children? Yes or no Energy level: medium energy Quiet or barky? 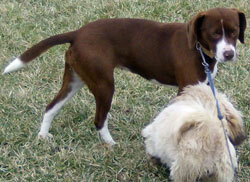 barks occasionally Personality: fairly well socialized, very well socialized, loves everyone. Update: Cecil and his sisters went to another humane society in Martha's Vineyard. We will forward applications to this agency. 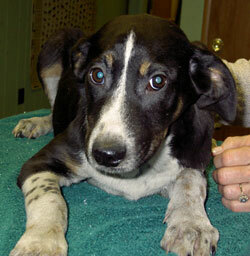 Cecil is the only male of four puppies who will be available on 3/8/10. He's a nice pup who loves to play with his siblings and to chase a ball. He likes toys, balls, and has just discovered bully sticks. He weighs around 23 lbs at 5 months, so might not be too large. He's on Eagle Pack Holistic with supplements. To meet him please fill out an application online and check out our Web site for visiting hours. Corey is a neutered male Yellow Lab who was seen being tossed out of a car, so he was brought to a veterinarian's office and they notified our partners in rescue. 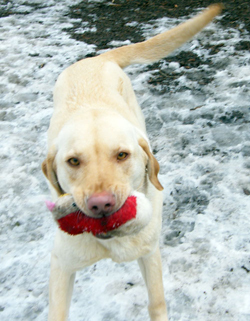 He is a wonderful, sweet yellow lab...who loves to play fetch and is happy all the time. He loves to present a ball or a toy to whomever comes into the play yard as a way of saying "Welomce, come on in"!! He is housetrained and quiet in the kennel. He is a speical lab. If you are interested, please fill out an application online. He will be at the meet and greet 12-3 on Wednesday and Thursday! Come meet this sweet boy! 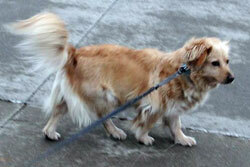 Daisy is a 2 year old spayed female Golden/Corgi mix dog who left at an Indiana shelter after hours, poor baby. She's a little bit of a dog, maybe 20-25 lbs. She is a sweetheart of a dog who deserves a great home. This is her "before bath" picture as we combed out the massive coat and she is small and sleek, but still fluffy enough for you to luxuriate in that fur. She is friends with her pals Fudgie and Tabby. Please fill out an application online if you are interested and check our visiting hours. 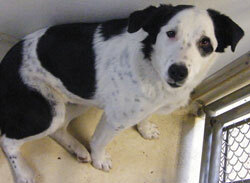 Fudgie is a 1 year old Beagle / Collie mix who is a sweet girl and plays well with all dogs. She's a nice size too, just a tad taller than a Beagle. She was picked up in Indiana as a pregnant stray. 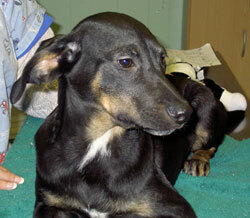 She was spayed and is now ready for a home of her own. Her coat is a gorgeous liver color and she has a sweet personality. She's quiet! Her pals are Daisy and Tabby. 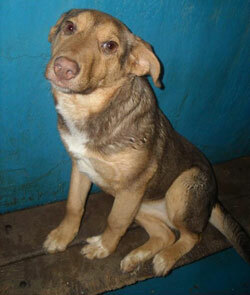 Fudgie needs a home where she can play and just be a carefree dog. Please fill out an application online if you are interested. She will be available on 3/8/10. Hannah is one of four puppies who will be available on 3/8/10. She's a lovely pup who loves to play with her siblings as well as follow around the adult dogs and mimic everything they do. They likes toys, balls, and has just discovered bully sticks. She weighs around 23 lbs at 5 months, so might not be too large. She's on Eagle Pack Holistic with supplements. To meet her please fill out an application online and check out our Web site for visiting hours. 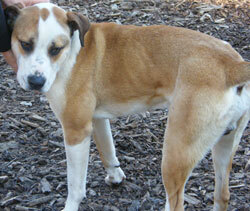 Jip is a 1+ year old Lab/Boxer who is available for adoption. He was in a high kill shelter and all the workers thought he was the best dog so they saved him and we are lucky to be caring for him. 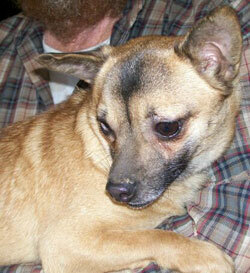 Jip was in a foster home and did great. He loved any visitors that came including men, children and cats. He slept on his dog bed all night, without making a peep. He seems to be housebroken and would go to the door to go out. He loves to ride in the car, go for hikes and hang out with his people. In fact the foster mom reported that they were putting up a gate and Jip just stood their as if at a moments notice he could go grab a tool for them if it was needed. He has a spot on his head named the kissing spot because he loves to be kissed or petted there. He is a wonderful dog! Please fill out an application and check for our open hours. If you let us know you're coming, we'll make sure he's here. 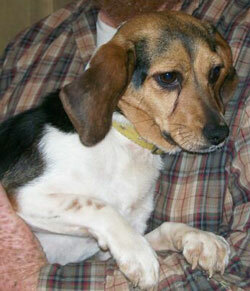 Li'l Girl is a very tiny Beagle girl who is around 2 years old. Spayed when younger, she weighs 13 lbs. She's great with all of the other dogs and the cats. It's just loud noises or sudden noises, and of course large, loud male humans that she's really scared of. She's also paper-trained, but we would advise a new family to crate train her. She's going to need a fenced in yard as she would run off if frightened. She is a little doll! Available 3/19/10. Moe is a gorgeous 9-10 month old Retriever with a luxurious coat and some white paws and a white tip of his tail, like a collie mix. He is mostly Lab and acts very labby. He is a very friendly happy dog who just wants to be with people. Moe loves everyone, including kids. He's good with all the dogs he's met, he's friendly with men, women, children. He weighs around 45 lbs. and is short, like the English-type of lab. School-aged and up would be great as long as he goes with an adult for regular exercise. When our volunteers came to visit the shelter he was at, he climbed the fence in order to be with them and was dangling by one foot, his tail wagging the whole time. He is neutered and ready to go home. 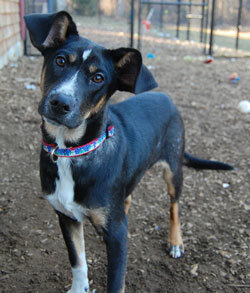 Patch is a one year old female Australian Shepherd mix who likes to play. During her temperament test she was all play bows. Nice dog. She arrives on 3/5/10 and is available after 3/8/10. Please check our visiting hours for her availability after you fill out the application. 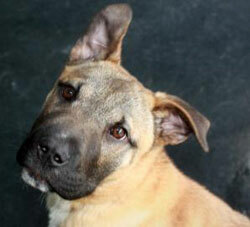 Roseanne is a 6-9 month old spayed female Lab mix who is very sweet. She has the most gorgeous, thick coat you will ever see. She loves toys and balls and playing with her dog friends. She will be available on 3/8/10. Please apply online first if you are interested. 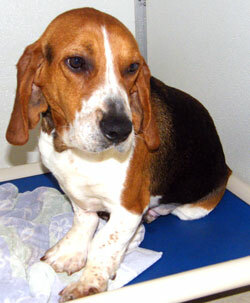 Sandman is a young, under a year old Beagle boy, registered as a Beagle, but looks very Basset. If you look at him, you're going to think he's got Basset. He's a VERY sweet boy. He was a field trial dog who didn't make the cut. He is fabulous with other dogs, has always lived with other dogs. He is as sweet as can be and needs a loving home who will a forever companion to the right home, someone who really appreciates the beagle breed. He is available now. 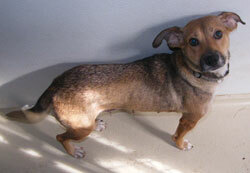 Sassy is a spayed female Corgi mix and is just 10 lbs. She is probably around 2 years old. Spayed in Jan. and rabies Dec. 11th. She's paper-trained but she does go outside with the other dogs. Sassy and Li'l Girl play well together. She doesn't like big dogs, but is not afraid of them. They are usually afraid of her, so a small dog household would be best. She was raised with a lot of other corgis. Available 3/19/10. If you are interested in meeing her, please fill out an application. 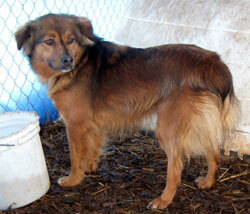 Tabby is a 1.5 year old spayed female mixed breed dog who came into an Indiana shelter with her puppies. She is friends with her pals Fudgie and Daisy. Please fill out an application online if you are interested and we will be in touch once she arrives.